Is Life Better Now Than 50 Years Ago? 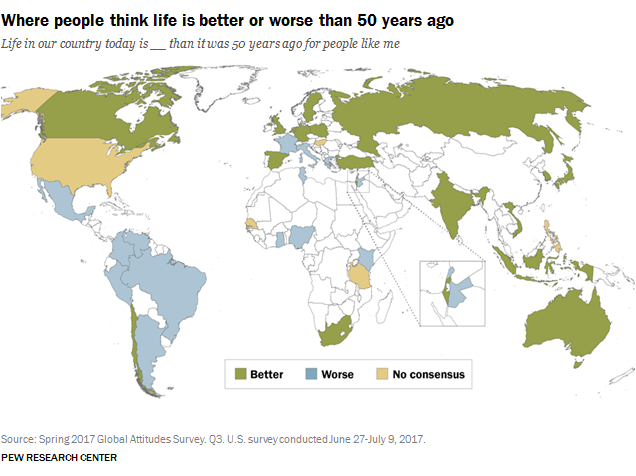 The Answer May Depend On The Economy : Parallels A new Pew Research Center survey finds people worldwide are divided on whether life is better today than it was 50 years ago. Economic strength tends to predict greater satisfaction, but not always. 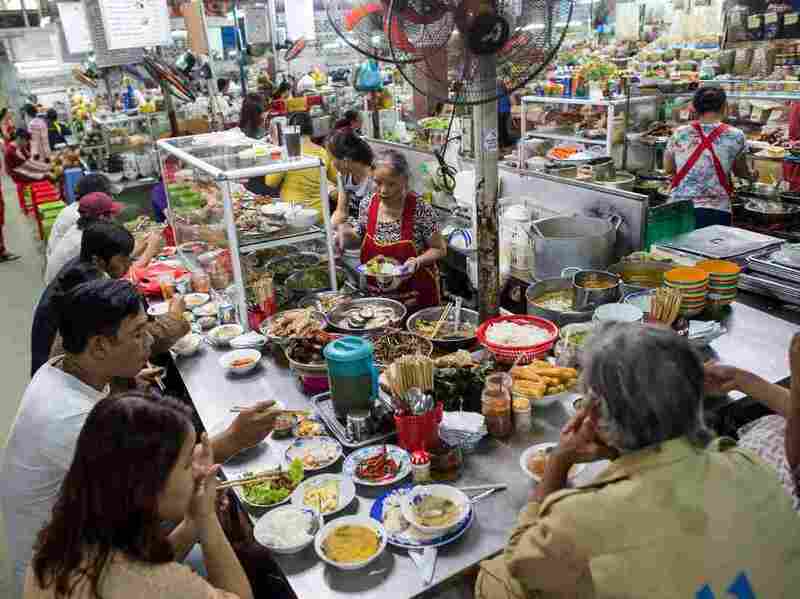 People eat at a noodle stall at the Han Market in the central Vietnamese city of Danang in November. Vietnamese respondents to the Pew Research Center survey overwhelmingly said life is better than it was 50 years ago. The way people perceive their country's economic conditions plays a big role in whether they view their lives more positively now compared with the past, according to a study released Tuesday by the Pew Research Center. Of the nearly 43,000 people surveyed in 38 countries in Asia, Europe, the Middle East, Africa and North and South America, Vietnam had the most positive self-assessment: Eighty-eight percent of respondents said life is better today in their country than it was a half-century ago. Other Asian countries round out the top five, including India (69 percent), South Korea (68 percent) and Japan (65 percent). At the opposite end of the survey, with the least positive assessment of their lives today, 72 percent of respondents in Venezuela said they are worse off. Bleak assessments were also reported by Mexico (68 percent) and Argentina (51 percent). "Latin Americans stand out for their widespread negative assessment of progress over the past half-century," the report says. The findings reported in "Worldwide, People Divided on Whether Life Today Is Better Than in the Past" are part of Pew's annual global attitudes survey. But this is the first time the organization has asked whether life in a person's country is generally better, worse or the same as it was five decades ago, says senior researcher Jacob Poushter. "We're interested in how people see sort of the changing nature of the world and how that affects their lives," he says. Thirty-eight countries were included in the Pew Research Center survey. While the results are subjective and depend on the historical events and politics of each country, Poushter says the biggest takeaway from this survey is that economic outlook is an important factor. "Exceptions aside about where actual countries were 50 years ago and what the history has been, it generally finds that economic satisfaction ... tends to be one of the strongest in terms of pushing people to say life is better or worse," says Poushter. For example, in Vietnam, 91 percent of respondents said economic conditions are good. According to the World Bank, Vietnam has become among the world's fastest-growing economies and is projected to continue that upward swing. In Venezuela, with the highest percentage of people saying life is worse, only 20 percent of respondents said the economy was good. A collapse of international oil prices has greatly affected Venezuela's economy, which is almost solely reliant on fossil fuels. Things have become so dire that the Venezuelan government announced this month it would create a cryptocurrency to combat high inflation and replace its virtually worthless currency, the bolivar. While the correlation between economic outlook and positive responses about life today was strong for most countries surveyed, it was not true in all cases — including the United States. "There are countries which, if you look at objectively, are doing well economically but [respondents] still said that life was worse today than it was 50 years ago," says Poushter. "Oftentimes, you see ... more issues with politics, issues with relatively more recent history, in terms of people more upset about where they are compared to 50 years ago." Among U.S. respondents, 37 percent said their lives are better and 41 percent said they are worse. 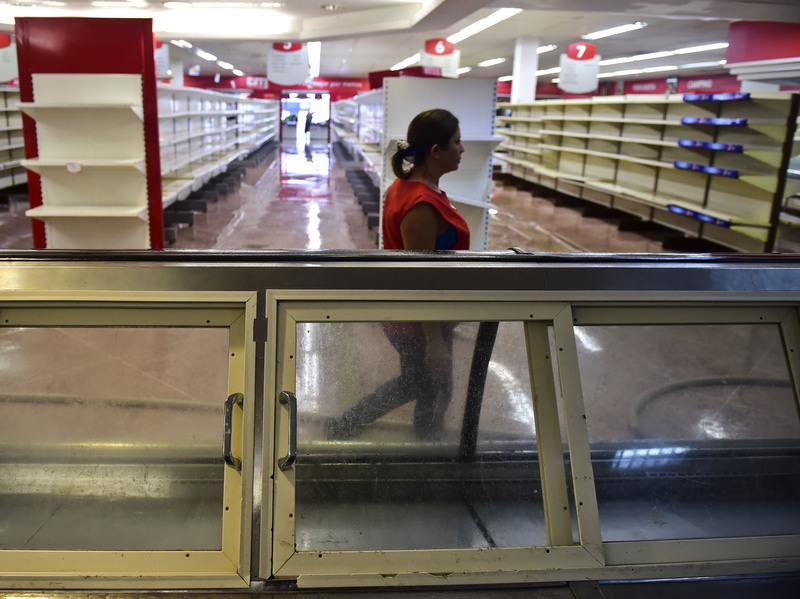 Anti-government looters attacked a supermarket in Venezuela's Carabobo state in May. Seventy-two percent of Venezuelans told the Pew Research Center they were worse off than 50 years ago. A lot of that comes down to political divisions, says Poushter. "It's just that in the last year, Republicans have become more likely to say life is better off, and Democrats have become less likely to say their lives are better off," he says. Political divides also were apparent in Europe, where those supporting populist parties such as the Alternative for Germany or France's National Front were more likely to say "life is worse off for people like them," the report says. The report finds education level is also a factor affecting whether people see their lives as better now than five decades ago. In more than half the countries polled, respondents with a higher level of education said that for people like themselves, life was better. The greatest educational divide can be seen in Poland, where 76 percent of more educated people said life was better than in the past. Fifty-seven percent of the less educated felt that way. The only two countries where the less educated saw their lives as better today were Nigeria and Turkey. Further, in some countries surveyed, the perceived gains and losses by certain religious and ethnic groups over the last 50 years played a factor in respondents' answers. For example, the survey found that black respondents in South Africa are "much more likely" to say life is better (52 percent) than it was 50 years ago, when the country was living under an apartheid system. Just 27 percent of white South Africans said the same.